California's new U.S. Senator Kamala Harris speaks during her election night watch party at The Exchange LA on Tuesday night, Nov. 8, 2016. 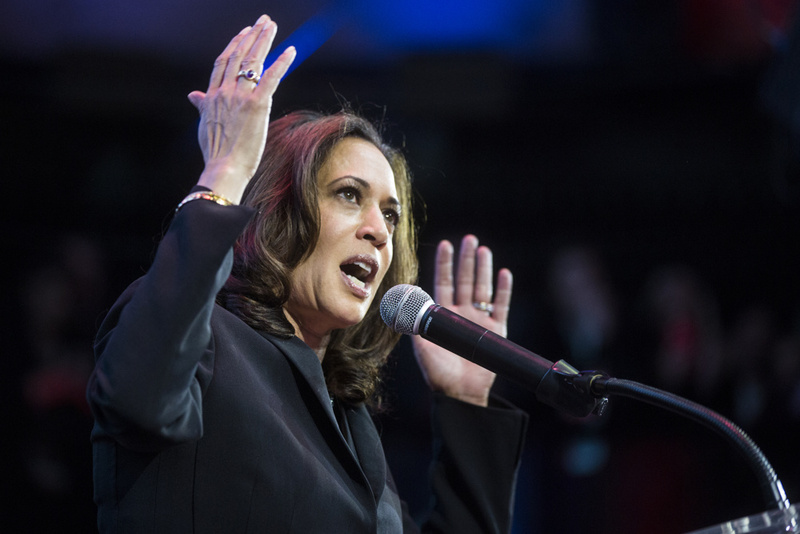 Harris defeated opponent Rep. Loretta Sanchez during Tuesday's election. It's been just over 4 months since California voters elected former Attorney General Kamala Harris as US Senator. Since then, there's been little time for rest. Harris serves on four senate committees, including two that have been working overtime. The Intelligence committee has probing allegations of Russian influence in last year's election. And the Budget committee has been going through President Trump's spending proposal which cuts a number of programs dear to many Californian's, including environmental protections. Take Two's A Martinez spoke with Senator Harris about how she's taking on the big issues in Washington DC. Is there one thing within the budget that you're determined to change? Unfortunately there's not just a number one fix in terms of the items. There are many. For example, after school funding. I want to make sure that we have sufficient after school funding so we can take care of our California's children. I want to make sure Meals on Wheels is not cut in that budget. But we need to completely overhaul what has been submitted. So unfortunately, it's so significant, that there can't be a piecemeal approach if we want to ensure the public health and frankly, the safety of especially vulnerable Californians. How would you specifically try and overhaul the budget? The way that we would overhaul it is one, send it back and require a budget that actually is much more in tune with the practical needs. But the other is to create our own budget. I know there's some talk about doing that. And I'm on the budget committee. If the Affordable Care Act is repealed and replaced with the GOP's plan, the American Health Care Act, how will you respond? I frankly think that the Republican plan to repeal the ACA is a values statement. And the statement they're making is that they believe that health care is not a right. They think it's a privilege only rich people can have access to. And that's a fundamental problem. When I look at the impact on California, I know it's going to... jeopardize the health of 5 million Californians, but to put it in perspective, we're talking about large numbers of Californians that are also going to lose Medicaid funding and Medicare. One in two California children is supported by Medicaid. What we're trying to do is basically defeat their attempt to eliminate the Affordable Care Act. It's been interesting to see that as the proponents of this plan that's being floated, as they go home to their districts, they're finding that their constituents are completely unhappy with this proposal. I think that the unfortunate reality is that a lot of the folks playing politics with our public health said they were going to defeat this thing and they were going to get rid of it. They were going to repeal it and by goodness, they're going to get it done. But they're not paying attention to the harm that their political campaign and their political promise will cause their constituents. How do you advance the cause of California when President Trump has said the state is "out of control"? I actually met with the governor in my office yesterday so, he and I had a good amount of time to catch up and check in about we can continue to collaborate to make sure California gets its fair share. There are a number of issues I've been thinking about. For example, I'm on the Environmental Public Works Committee and one of the issues that I'm focused on there is infrastructure and highlighting California's infrastructure needs as it relates to water, but also as it relates to transportation. The president has said that infrastructure is a priority for him so we actually have submitted a proposal for what the infrastructure plan for the country should look like. I'm pleased to tell you that it is a collection of California mayors in particular who helped me submit our thoughts for what that infrastructure plan should be. That's an example of what we can do to make sure that California gets its fair share. I'm now living in Los Angeles and I can tell you, spending hours on the freeway of Southern California– I think anybody who does that knows that we have real transportation needs. You tweeted "Americans deserve the full truth about Russia's ties to the Trump campaign". How do you get to the bottom of that? First, let me just say that on the issue of Russia, I think there's no question that we have to think about the importance and the significance of Russia's role in our election. I take my role on the Senate Intelligence Committee very seriously. The American people deserve to have the truth when it comes to the concern that Russia tampered with our elections and our democratic process. These committees have a role to play. I'm asking a lot of tough questions. I think that the United States Department of Justice needs to appoint a truly independent special counsel to oversee the FBI investigation. The American public has to have some transparency in this system and that there be accountability. As a career prosecutor, I feel so strongly about that so we're doing the work that needs to be done here to make sure that that happens. Is Twitter an effective way to take on your political opponents and their policies? Twitter is on effective way but there are so many. But I do believe that communication is critical. I want to do everything I can to share with Californians anything I can about what's going on in Washington DC so that people know what's going on. Then they can have some say in what's going on. We've got a pretty robust, thriving and very active offices in California. There's one right downtown in LA. We've been doing a lot of interesting and exciting work including after the Muslim ban came out, a bunch of my staff went to LAX to make sure that those refugee families were getting the support they needed. And I get letters every day that I read. All of that is about just keeping an open flow of communication. Does California need to take a more active role in challenging the Trump administration's travel bans? I think California is taking a role of leadership. California recently joined a lawsuit on the ban and I thought that was the right and smart thing to do. We have an outside stake in the outcome of these issues. We have the largest number of immigrants documented and undocumented of any state in the country. California does. I can certainly look at the work that we're doing in terms of holding the folks in DC accountable. These executive orders is a part of that. To listen to this interview, click on the blue media player above. HighQ: Should California's pot industry look more or less like the alcohol industry?